Captain Elizabeth Ashcroft is a Federation Starfleet officer and the commanding officer of the Federation starship Yorktown. A hard-nosed, confident and determined officer, Elizabeth obtained command of the Yorktown following several years as the ships first officer. Previously, she had served many years in the Judge Advocate General's office, then a year-long assignment as adjutant to Admiral Reytan Grax during his tenure as commander of the Fourth Fleet. 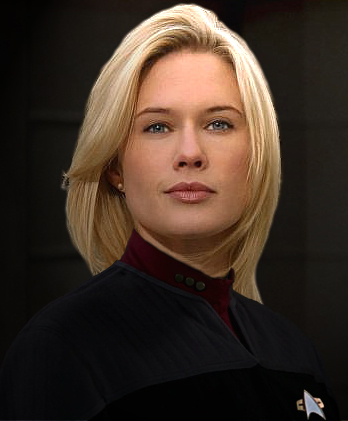 Elizabeth’s career started when she left her homeworld of Archer IV and enlisted in Starfleet at age 17. Her only intention at the time was serving the minimum detail; an easy method to get out and see different parts of the galaxy while she was still young. However, the young girl’s short-term plans quickly turned upside down the very first week of her very first assignment. While on assignment at Starbase 103 in the Lorenze Cluster as a stellar cartography specialist she was both witness to a murder and victim of a resulting assault. The entire incident was enough to create inspiration in a young girl by the sectors JAG prosecutor in the matter, and Starfleet Security’s investigation, to find her way into a path into a law career. After completion of a six-year joint program at George Washington University and Starfleet Academy, Elizabeth was assigned as a lieutenant to the Federation embassy on Romulus. Her primary duty was as a litigator helping to assist in the formation of better relations between the two governments. Unofficially, however, she was tasked with helping Federation citizens to be properly represented in many cases against the harsh Romulan courts governed by the Tal Shiar. Helping to ensure fair, balanced cases with proper and evenly distributed sentences, Elizabeth spent two years immersing herself in not only the Federation law she was familiar with but also Romulan law. When the Dominion War was at full escalation more able-bodied officers were needed in the main fleet. Elizabeth was given a battlefield promotion and recalled to the Third Fleet to serve as the first officer of the USS Venture due to her extensive command training during the academy. The war had been the first foray for Elizabeth in the life of a frontier officer, and was a crash course in life on a starship expanding much of what she had originally learned – and forgotten – during her time at the academy. It was in the fleet where Elizabeth would remain for several years following the conclusion of the war. She had grown accustomed to life on a starship and was more battle-tested after the heavy final engagements of the Dominion War. Life on the Venture was almost relaxing to Elizabeth; she greatly enjoyed exploring the frontier of Federation space following the war. The next major galactic incident shifted her career again, back to what she knew best: the Shinzon Incident. During the recovery effort, the Venture served mostly as a ship giving humanitarian aid to Romulan border colonies that Romulus could no longer properly support. At the conclusion of the main efforts, Elizabeth was interested in being involved in the follow-up detailed negotiations and settlements following between the Federation and Romulans. However, Admiral T’Lara had different plans for Elizabeth assigning her as the chief prosecutor, operating out of Starbase overseeing several hundred cases in many different sectors of Federation space every year. With her career spiraling upwards at a fast rate, Elizabeth was proud of her accomplishments. She had also earned a reputation as a hard-nosed prosecutor with a strict code of legal ethics which often overshadowed even her own personal beliefs. She had even been known to bend the rules on occasion to suit the need to earn a guilty verdict in high-profile cases. But that never stopped her from being diplomatic, fair, and empathetic to the plight of the defenseless. It was several years later when her career would again take a drastic turn when she was reassigned by Admiral Reytan Grax, commander of the Fourth Fleet, to be his adjutant. Another position she excelled at, it was only a temporary one from the start. Grax needed someone to handle certain projects he set forth while he was preparing for retirement, a job Elizabeth was happy to do for the admiral. As a reward for all her work during their year together, Grax’s last official order was to assign Elizabeth as the first officer of the brand new USS Yorktown, one of the most prestigious assignments in all of Starfleet, under Captain Trevor Hall. The Yorktown’s very first assignment was to leave from Utopia Planitia to Starbase 12, but while en route the Hobus supernova occurred. Starfleet Command ordered the Yorktown offload a majority of its crew at Starbase 12, and proceed to the Romulan system as one of the few ships with a warp drive capable of getting there in time. Ashcroft’s first assignment as the first officer of the Yorktown quickly turned into an evac mission and a formidable test of the Yorktown’s automated systems. The Yorktown performed admirably and were able to rescue over 13,000 Romulans, however, Admiral Grax who had been ferried along to Romulus was lost. The following two years Elizabeth was an exemplary first officer under Captain Hall as the ship was assigned to deep space exploration of the Beta Quadrant. Finally, in 2389, Captain Hall was reassigned to Starbase 17, leaving the door wide open for Elizabeth to accept command. This also left Elizabeth in a whirlwind of emotions, unsure if she was ready for the burden of command by herself, and fraught with imposter syndrome.